Lights Out Breaks Its Own Rules! The premise of Lights Out is intriguing: a dysfunctional family torn apart by the mother’s psychological issues, which take on a life of their own – or are taken over. The problem is that before we’re a third of the way through the film, it breaks its own rules. 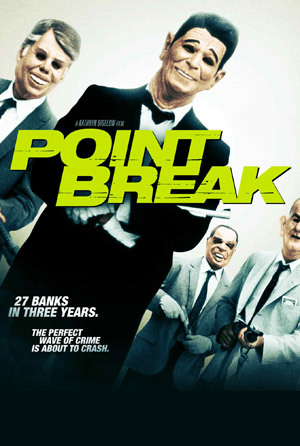 Extreme athletes disrupt the world’s financial stability – and for fun – in the reimagining of Point Break. It takes an extreme athlete to catch an extreme athlete, so FBI agent Johnny Utah (Luke Bracey) goes undercover to infiltrate the group led by Bodhi (Edgar Ramirez) and bring them down. But does his affinity for their thrill seeking ways keep him from bringing the hammer down? The first trailer for Point Break is now out and it’s a sleek, fast-paced load of thrills that makes us wonder what they can possibly do to make the movie even more dynamic. Check it out after the jump. Point Break will base jump into theaters on Christmas Day. Delroy LindoEdgar RamirezEricson CoreKurt WimmerLuke BraceyMovie TrailersPoint BreakRay WinstoneTeresa PalmerWarner Bros. I Am Number Four – A Little Romance, A Lot Of Action! There are some producers whose stamp can be seen on a film regardless of who directed it [think Transformers – Steven Spielberg’s influence could be felt throughout, even above Michael Bay’s action sequences]. With I Am Number Four, it is Michael Bay’s influence that overrides D.J. Caruso’s direction in the final act – resulting in a film that may hew close to the novel [I haven’t read it, hence ‘may’] but falls apart, character-wise at the end. I Am NUMBER FOUR Profiles: Number 6 and Sarah! We’re a week away from the release of D.J. Caruso’s I Am NUMBER FOUR and the folks at Disney/DreamWorks have released a couple of video profiles – Dianna Agron’s Sarah, and Teresa Palmer’s Number 6 – to whet your appetite. Check them out after the jump.